Ms. Kerns will be performing her very popular Patsy Cline tribute show. She will also be providing a PA system, and DJ services. **Patsy Cline (Virginia Hensley) is descended from the Hottel & Keller families (the host property of GermanFest) on her mother’s side of the family. Check the About Us page on the GermanFest website to show her descendancy chart. Dave Kyger is a ninth-generation descendant of German immigrant Christian Geiger who came to the New World on the Charming Nancy in 1737. Dave has been involved with Bluegrass and Country Music for over forty years having been a member of several performing bands and one of the current organizers and performers at the popular Spike Jam Sessions every Friday night at the Chimney Rock VFW four miles west of Broadway on Route 259. Dave has formed a band he laughingly named Uncle Dave and the Whippersnappers. This group of neighbors and family will leave you entertained, amused, and laughing specializing in hard driving banjo and fiddle tunes! Award winning banjo player Jack VanOrden started playing the banjo and guitar when he was ten years old and has recently come on as a great singer. Dave’s thirteen year old daughter Kaley began sawing the fiddle under local legends Spike Stroop and Greg Lam. She has played onstage with Rhonda Vincent and is a promising young fiddler. Uncle Dave’s Finnish wife, Pirjo Nylander, rounds out the band on the bass fiddle. Who knows, maybe the Old Marine Drill Instructor Jack’s dad, George VanOrden might even get up and do one of his crowd pleasing numbers! The quartet will be playing traditional German music. Instrumentation to include: accordion, tuba, trumpet, saxophone, guitar, and bass. The founding members of the band (Richard Adams, Buddy Thomas, and Jim Harrington) have performed together for over 25 years in a variety of genres and settings. They first developed their German program at the request of a JMU Dance professor who needed a live band to accompany the German folk dances her students were performing. That was about 21 years ago. 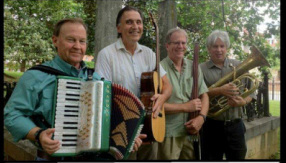 Since then, they have performed in a variety of settings, including several years at the Frontier Culture Museum in Staunton and at last year’s GermanFest!